Made in Australia, Oceania, c.1837. This uniform was worn by Edward Deas Thomson, who served as Colonial Secretary of New South Wales from 1837 to 1856. As a member of the Executive and Legislative Council, Thomson wore the official uniform as set down in the colonial regulations of the day, which detailed the dress requirements as established by the Court. 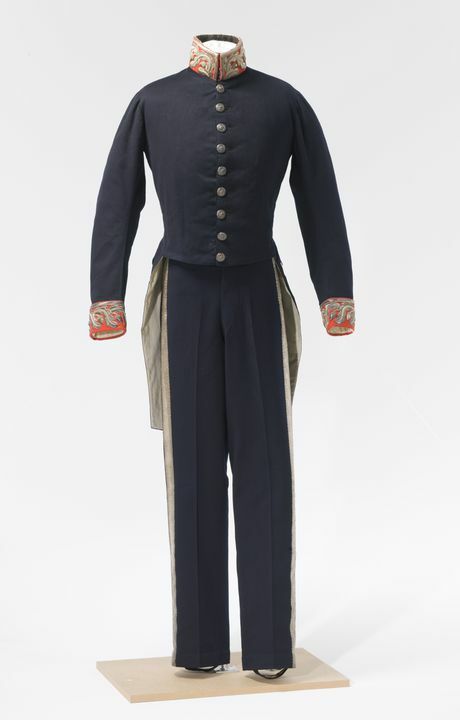 Uniform consisting of matching navy blue wool tailcoat and trousers. Semi-fitted tailcoat of navy blue wool with straight cut-away front and above the knee length tails. Tailcoat has a standing mandarin collar of red wool decorated with silver oak leaves and acorns. Cuffs decorated with matching embroidered trimming. Tailcoat opens at centre front and fastens with nine metal buttons decorated with crown and laurel wreath. The reverse of buttons marked 'FIRMIN & SONS 153 Strand London'. Standing collar fastens with three metal hooks and eyes. Tailcoat is fully lined with a centre back vent with side pleats and concealed pockets. Vent trimmed with four metal buttons. Pair of straight legged trousers made of navy blue wool and decorated with matching silver brocade stripe featuring oak leaf and acorn design down outer seams. Trousers secure with a buttoned fly with waist featuring five buttons on the outside and two buttons on the inside. Under foot strap secured to each leg hem with buttons. A concealed money pocket is located inside right front of waist. It is likely that this uniform was made in England, or was made in Australia from imported materials and official buttons. On the reverse side of the buttons is marked: "FIRMIN & SONS 153 STRAND LONDON". Firmin & Sons was established in 1677 and is one of the longest established companies in England. The company is still in operation in 2007, holds three Royal Warrants of Appointment, including button manufacturer to the Queen, and is the official supplier of a wide range of uniform accessories and equipment to the UK Ministry of Defence (Firmin 2007). As is usually the case with such uniforms, the style is conservative and formal. It is made of navy blue wool and follows the official uniform as set down in the colonial regulations of the day. All details, from the number of buttons through to the style and width of braiding, were meticulously executed according to the position of the wearer. Deas Thomson was appointed Colonial Secretary of New South Wales and Registrar of the Records in 1837, positions which carried with them membership of the Executive and Legislative Councils. This uniform, consisting of dress coat and trousers, was worn by Sir Edward Deas Thomson (1800-1879) during his time as Colonial Secretary of New South Wales from 2 January 1837 to 6 June 1856. The suit was formal diplomatic wear for colonial secretaries. The Deas Thomson suit is a very small size. While later photographs show him as portly, in his younger days he must have been quite slim.